This Bird weighs Fifteen Ounces and in Size is somewhat less than a Crow. The Bill is Blue; but darker towards the Point. The Irides of the Eyes are Yellow. The Head and Neck are of a changeable Purple. All the Rest of the Body is Blue. The Legs and Feet are Green. From the Breast hang long narrow Feathers, as there do likewise from the Hind-part of the Head; and likewise on the Back are such like Feathers, which are a Foot in Length, and extend four Inches below the Tail, which is a little shorter than the Wings. 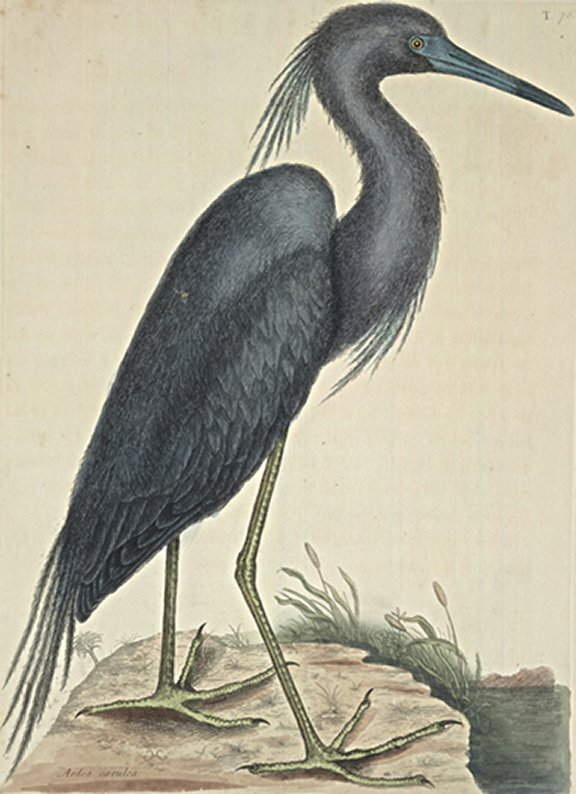 These Birds are not numerous in Carolina; and are rarely seen but in the Spring of the Year. Whence they come, and where they breed, is to me unknown.